Seen from across the Seine River, smoke and flames rise during a fire at the landmark Notre-Dame Cathedral in central Paris on April 15, 2019, potentially involving renovation works being carried out at the site, the fire service said. 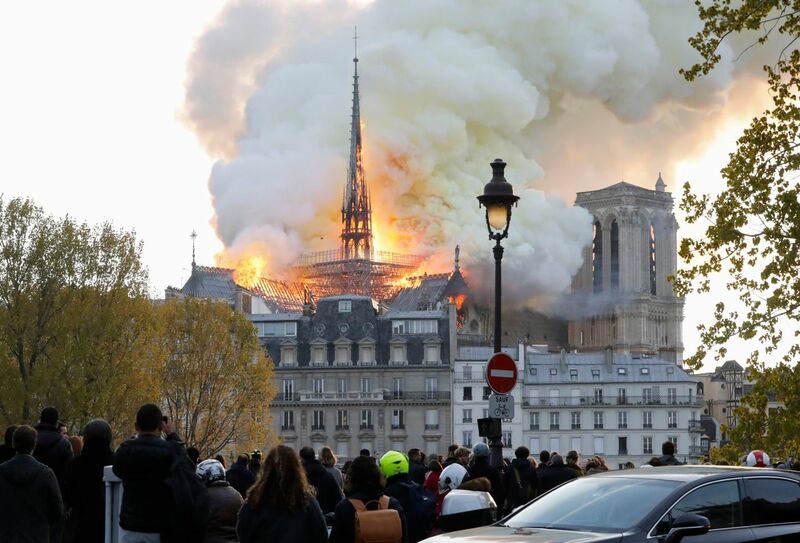 The roof of Paris’ famed Notre Dame Cathedral collapsed Monday as a massive fire ripped through the structure. The city’s mayor and firefighters warned people to stay away from the area. There have been no confirmed deaths, according to Paris police, while an official said no injuries had yet been reported. #NotreDame: ‘The roof has entirely collapsed, there are flames coming out the back of the cathedral as if it was a torch’@charli, Journalist at France 24, at the scene of the fire. President Emmanuel Macron will be going to the scene of the fire, according to an Elysee official. Emmanuel Macron mourned the landmark in a tweet. He also cancelled an address to the nation that he had been due to give later on Monday evening. This Family Is Praying For A Miracle After 4 Year Shot Himself In The Head With Gun Found Under A Pillow. He Was In ICU And Now Out! Howard Stern announces retirement after 35 years claiming Radio has effected his health!